The U.S. Environmental Protection Agency (EPA) recently released its latest annual report on the state of municipal solid waste (MSW) management and recycling in the United States, and the results present some cause for concern about the progress we are making in trying to establish a more circular economy—that is, an economy in which wastes increasingly supplant virgin materials in the supply of raw materials for products. A welcome development is a change of emphasis in the MSW report. Whereas past MSW management updates were released with neutral, soporific titles like Municipal Solid Waste in the United States: Facts and Figures, the latest report is titled Advancing Sustainable Materials Management: Facts and Figures 2013, reflecting the agency’s emphasis on the importance of what it is calling “sustainable materials management” (SMM). As EPA says in the introduction to the report, the new name is meant to suggest that “EPA is thinking beyond waste.” SMM refers to “the use and reuse of materials in the most productive and sustainable way across the entire life cycle,” the agency says. “SMM conserves resources, reduces waste, slows climate change, and minimizes the environmental impacts of the materials we use.” A lot of the data in the report focuses on how materials are being reused, rather than simply providing a breakdown of what’s going to landfills and incinerators and what percentage of overall waste is being recycled. EPA is hoping to lead the way in changing how we look at the management of materials and resources. Are we following? The facts and figures cited in the report, which presents data on MSW management and recycling in the United States for the year 2013, suggests some pause in the progress we had made in reducing waste and diverting materials from landfills and incinerators in previous years. According to the report, 254 million tons of MSW were generated in the United States in 2013—3 million more tons than were generated in 2012. That difference may suggest continued growth in the economy, and our purchase of more stuff as we improve our economic lot. Perhaps the increase in MSW generation could have been higher still if many of us hadn’t changed our consumption patterns and recycling practices for the better in recent years. But the increase suggests that we’re still short of “decoupling” economic growth from resource consumption, even though there are signs, as EPA acknowledges, of some piecemeal forms of decoupling. On a per capita basis, we increased our MSW generation to 4.40 pounds per person per day in 2013, up 1% over 2012. Again, little sign of any decoupling. During 2013, about 87 million tons of MSW were recycled or composted, with 65 million tons recycled and the rest consisting of food waste and yard trimmings recovered for composting. That 22 million tons is 1 million more tons than the food waste and yard trimmings composted in 2012. So there’s a bit of progress there (the rate of consumer electronics being diverted from landfills is increasing as well). However, the overall recovery rate for recycling (including composting) was 34.3% in 2013, slightly lower than the 34.5% in 2012. We seem to have hit a ceiling. Why? A recent article in the Washington Post has some suggestions. The factors are complex, but generally revolve around two things. First, a fall in commodity prices has led to a slackening of demand for recyclables, thus driving down margins for commercial recyclers. Second, the move to make things as easy as possible for households has led to amenities such single-stream recycling at a time when people are still confused about what they can or cannot put in their bins. Apparently, that’s leading people to throw a lot into their bins that’s actually garbage—and commercial waste management companies are spending a lot of time and money in removing such materials (and sorting the recyclables) at their materials recovery facilities (MRFs). That’s placed more pressure on margins, to the point where, as the Washington Post article says, more than 2,000 municipalities around the country are paying to dispose of their recyclables rather than making money off the operation—as it was designed to be. Making recycling easy for households is a top priority. But educating the community about what can and can’t be recycled has to be right up there as well. There’s no shortage of innovators and entrepreneurs out there who are finding clever and economical ways to reuse materials that the rest of us would discard. It’s a matter of helping the average household and our municipalities keep up with the market and understand what it’s capable of doing. Visitors to the Melrose Recycling Committee website should take a look at the Recyclopedia page to find out more about what they can and can’t recycle, and what their recycling options are. With the gardening season well underway, it can never hurt to gain a few helpful tips on how to improve your skills in the yard. A little more knowledge about what grows well here in eastern Massachusetts, what compost can do for your garden, and what kind of watering regime can be effective without being wasteful can go a long way towards making your flower beds—and vegetable beds, if you have them—the little islands of peace and paradise you always wanted them to be. 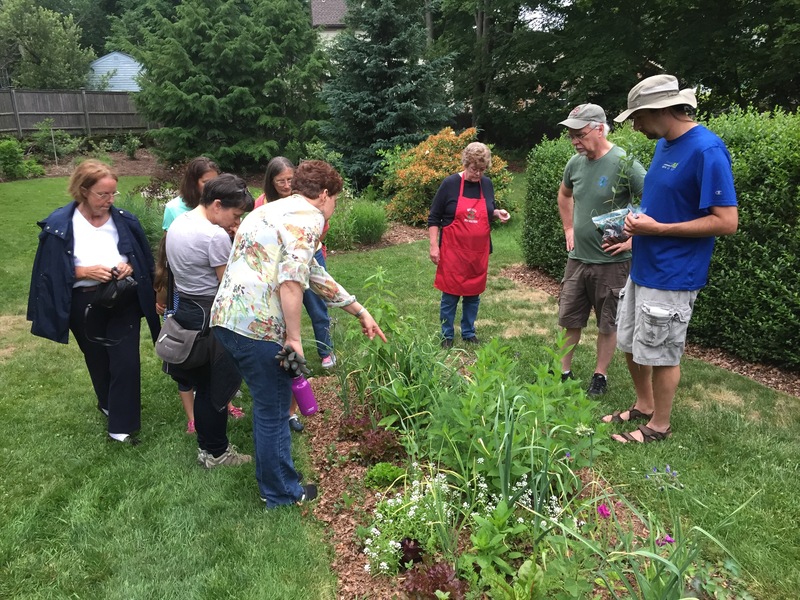 In mid-June, about 25 to 30 residents of Melrose took the opportunity to learn more about gardening and composting through a tour of a local garden featuring native plants and an array of composting systems. 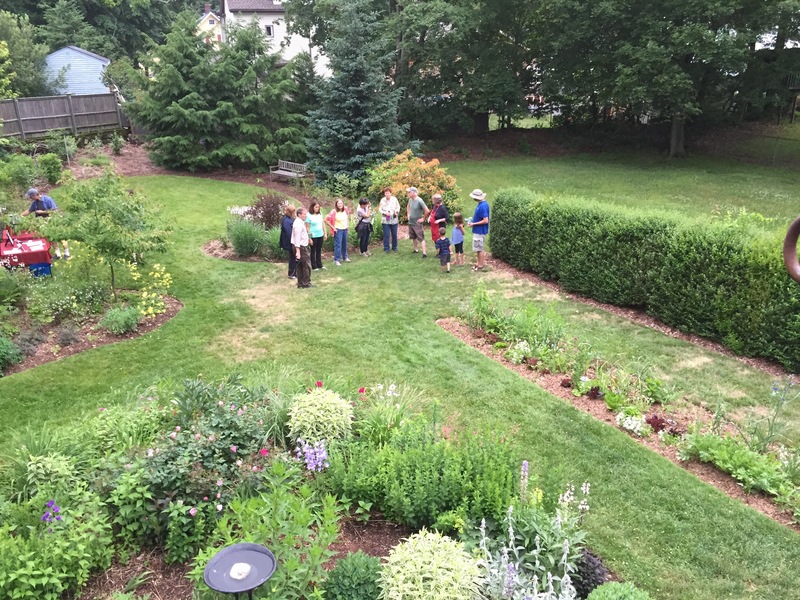 With the support of the Melrose Recycling Committee’s Composting Subcommittee, Joan and Phil Lounsbury opened up their garden here in Melrose for the tour—and what a delight it was for all who attended! The garden itself is dominated by flower, grass, shrub, and tree species that are native to our nation and our region—swamp milkweed, coral bells (heuchera), Canada columbine (aquilegia), panic grass (panicum), blue-eyed grass, winterberry, red and black chokeberry (which help attract birds), and pagoda dogwood (cornus alternifloria), which is very local and also produces berries. Joan and Phil have worked hard to remove any invasive species. The lawn itself had been one of those five-step, chemically treated lawns when Phil and Joan moved in years ago, but Phil laboriously converted it to a completely organic lawn—one that’s as lush and green as any you’ll see in Melrose. At time of the tour, Phil and Joan were in the process of setting up their rain barrel, to help recover rainwater and supplement their use of city water. Also to reduce water consumption, instead of using a sprinkler, Joan can-waters where needed, and the vegetable and annual herb gardens are equipped with soaker hoses. For plants in their first year, a lot of care is required, in the form of regular watering. “We baby them,” Joan says of new plantings. She enhances the soil while she plants, adding compost and good soil from other sections of the garden, and using mulch, including clippings of dead stalks and stems from around the garden. Second-year, established plants can be watered as needed—if they begin to have that wilted look, or if there have been several hot, dry days in a row, as we do experience in July and early August. Compost is not just needed for first-year plants; it’s a great addition to all beds, adding nutrients and even helping—along with mulch—to retain water and thus use less water overall. Phil and Joan have several types of devices in which they compost, but Joan is quick to point out that it’s not the container that matters: it’s the process. For example, in several wire-mesh bins, Joan and Phil are using a range of methods, starting with a “hot composting,” in which freshly cut grass and “brown” materials such as shredded leaves are combined in a 3×3’ bin—“as high as you can pile it”—to produce compost in about two to three months. A “let it rot” bin stores various materials from the yard and are allowed to do their own thing for a couple of years before any product is ready. Another wire-mesh bin takes hedge clippings that break down in a comparatively slow process. In a tumbler, or spinning composter, Phil and Joan add chopped leaves, garden clippings, sticks and twigs in the fall and then start adding food scrap from the kitchen in April. Regular spinning yields a usable product by late June or July, after which the cycle begins again with whatever “brown” materials from the yard can be found and included with the “green” stuff from the kitchen. “Brown + Green” is the most important take-away lesson, Joan and Phil advise. The brown—the leaves, twigs, cuttings, etc.—provide the carbon that’s a necessary ingredient in the final product, while the green—food scrap, grass clippings—provides the nitrogen. After that, the most important lesson is that composting requires attention. It doesn’t have to be hard, but you have to monitor, turn your piles occasionally, and keep them moderately wet. Incidentally, Joan and Phil also have a top-loading composter much like the ones our Melrose Department of Public Works sells to the public. In this system, they store sifted compost generated by the other methods. Joan advises that it is good to let fresh compost sit and cure a bit more before applying it to the garden. In the end, there are many ways to approach composting and garden management. Everyone should be able to establish an effective system to fit their own lifestyles. Those Melrose residents attending the tour had many questions and clearly came away with good tips on how to get more out of their own gardening efforts. A threatened thunderstorm held off, and everyone made the most of it. Here’s a list of companies that supply different kinds of composting systems. Check them out and see if something looks right for you. For other resources and information about composting, visit melrecyclingcommittee.wordpress.com/resources/compost/. Also, the Melrose DPW holds an annual sale of compost bins. The next sale will be in the spring of 2016. In the meantime, happy gardening!